Trail #2, a.k.a. the Parallel Trail, is located in the Rabbit Valley area of the McInnis Canyons National Conservation Area near the Colorado/Utah state line west of Grand Junction, Colorado. The trail begins near the Mountain Bike Staging Area, just south of the Rabbit Valley exit of Interstate 70, and works its way south, for about 5 miles, towards the Colorado River where it comes to an end, just across the state line, at the junction of the Kokopelli and Western Rim trails. 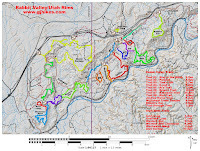 Trail #2 is a common route used to access the popular Western Rim trail. Some sections of the trail are open to ATV's while all of it is open to hikers, horses, dirt bikers and mountain bikers. To get to the Mountain Bike Staging Area head south after leaving the interstate and take the first left a short distance past the end of the pavement. The trailhead is nestled against a small rocky outcrop on your left. To get to the beginning of Trail #2 turn right out of the parking area and then left at the intersection heading away from the interstate. The trail departs from the road almost immediately on the right. The trail begins with just enough of an uphill climb to get your legs warmed up before making a drop down to a wash were it begins its next short climb. Trail #2 cuts across the Kokopelli trail at its first encounter with it and at its next encounter a short distance away it begins following it. Just before dropping down a very rough section there is another parking area on the left. 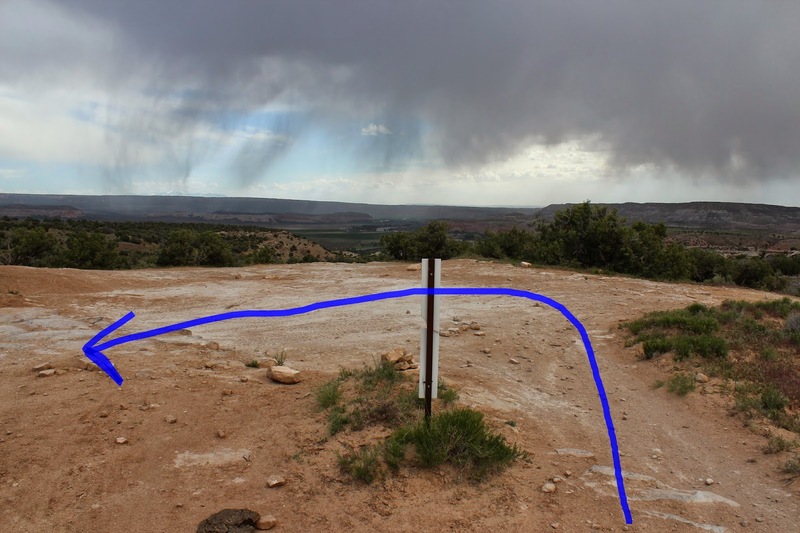 Much of the Kokopelli Trail, both in Colorado and Utah, is open to vehicles. Any vehicles proceeding down this particular hill will need to have a high clearance to make it over the rocks. Just over the hill the trail departs on its own again toward a ridge of sandstone cliffs. Some of the best scenery on the trail is through this area. For one last time Trail #2 makes use of the Kokopelli Trail, passing between the Castle Rocks camping area and the McDonald Creek Canyon trailhead. Both of these locations have vault toilets. After passing through this area the trail departs the road once again to the right. Much of Trail #2 is easy enough that you can make pretty good time on it. The steepest sections of the trail are near the end where it has to gain several hundred feet of elevation to get to the top of the ridge. The trail ends near the junction of the Kokopelli and Western Rim trails with distant views of the Colorado River coursing through the west end of Ruby Canyon. 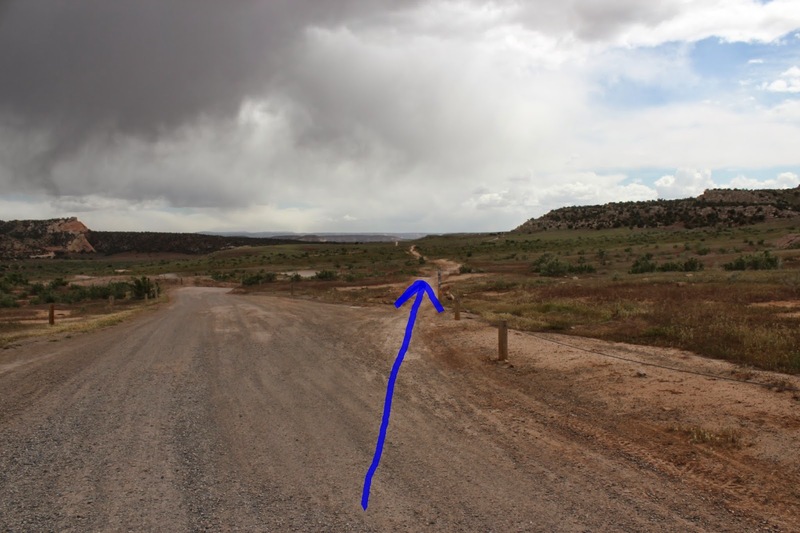 For this post we are going to follow the Kokopelli Trail back to the start. The Kokopelli Trail has its rough spots but for the most part it is a quick ride. Loose sand gets blown in and deposited on the road along a few stretches but most of it is downhill so no big deal. We jumped back on Trail #2 for the last mile to the trailhead. 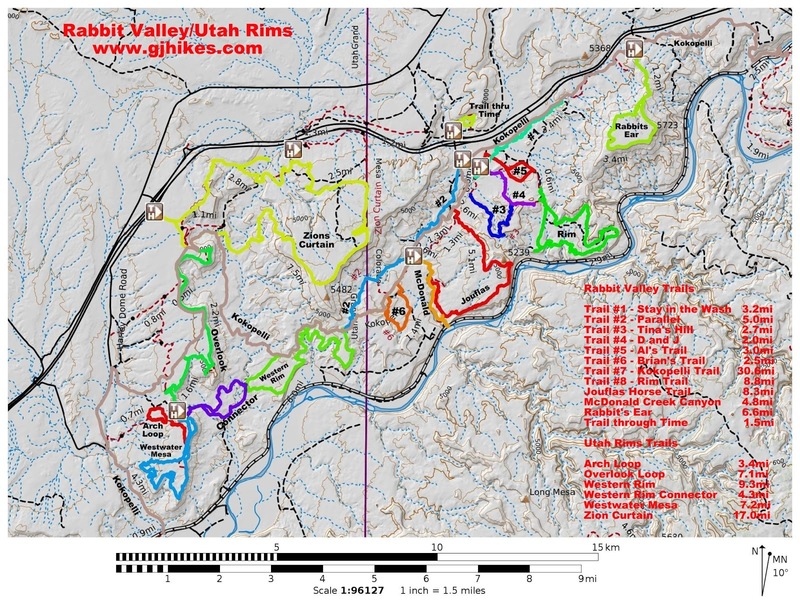 For this post, and several other of the longer trails in the Rabbit Valley/Utah Rims area, we made use of our mountain bikes rather than the usual hiking. This outing occurred later in the day after getting off of work. The parking lot is normally packed on the weekends but as you can see on this day we pretty much had it all to ourselves. The trails in the Rabbit Valley area shed water quite well and sometimes they are even better after they get a little rain on them. If you would like to see it for yourself then all you have to do is grab your bike or 'Take a hike'.